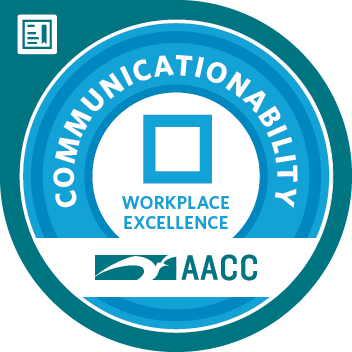 COMMUNICATIONability focuses on consistently delivering effective verbal and non-verbal communication in the workplace. Apply basic communication skills to enhance verbal and non-verbal communication and active listening. Use a three-step process to plan, deliver, and continuously improve verbal and non-verbal communication. Employ strategies to improve confidence and first impressions during greetings and introductions in the workplace. Apply techniques to strengthen verbal messages through effective non-verbal communication and use of the voice.